Steve has disappeared in a mysterious temple. 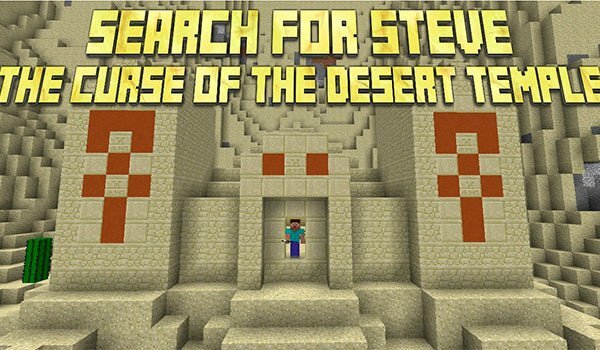 Search for Steve: The Curse of the Desert Temple 1.8 is a map of adventure in which you play a character who travels into a Temple of Doom, located in a desert in search of the greatest hero of all time in Minecraftia, Steve. Steve is a born adventurer, who has defended the world countless times of fierce night attacks of monstrous beings Minecraftia. The world can not afford to lose Steve. However it has disappeared into a mysterious temple. The locals call it the Temple of Doom, and you’re the chosen one to go for Steve and rid the temple of his curse. How to install Search for Steve: The Curse of the Desert Temple Map for Minecraft 1.8? The greatest hero of all time has gone on this damn temple!